Clara Osagiede, who spoke at our event last Saturday about Migrant workers, is an RMT representative employed by Initial Cleaning Services on London Underground. On 4th March 2011 Clara witnessed members being forced to clean graffiti off a tube train in the ‘acid shed’ at Hainault Depot. Aware that the staff involved had no appropriate training to carry out what could be a very hazardous task she raised concerns with the manager on duty who told her it was none of her business and to get out of his office. Victory. They did not even get to the disciplinary because of the existing grievances, her job is safe for now. So Clara was out by 1.00pm and heading down to speak at the UCL demo. Good solidarity demo with people there from lots of different unions and groups. Clara explained she was a Health and Safety rep and that it was her business. The manager became aggressive and shoved her out of the office slamming a door behind her. She reported the incident to other management and to British Transport Police. The manager was suspended but not for long. A few days later Clara reported for work to find the manager back at work without due internal processes being completed. Terrified she withdrew to a safe place of work locking herself in an office. Clara is now suspended for standing up for vulnerable workers being made to undertake dangerous duties in the acid shed for which they are not trained. Clara, who spoke at our Beyond Borders event on the 21st May, had previously faced trumped up charges ‘of gross misconduct’ by bosses have not hidden their desire to break the union. Clara has been a breath of fresh air in the labour movement in London and an inspiration to many workers. 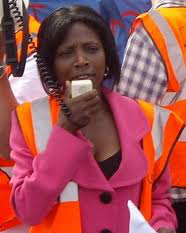 She was at the forefront of organising the cleaners and played a leading role in the pioneering strikes in July 2008 across the London Underground to secure the living wage. This entry was posted in Uncategorized and tagged clara osagiede, living wage, london cleaners, rmt, royal household. Bookmark the permalink. Of course we will support the lady. She needs it. Definitely.